Well I went and did what I told myself I wouldn’t do. I jumped in with both feet and my part time job this week has been full time. Even some OT. While the summer funds are growing not much else is getting done at home or to plan for my next trip. I have enjoyed working again though. I’m good at customer service and sales. It feels great to be good at something and to be recognized for doing that good job. After the special project I’m working on is completed I’ll scale back a bit. Going from zero to 40+ hours a week was not the plan. I’m looking forward to a Sunday road trip to regain some focus on myself and family. Perhaps even bringing along a calendar and planner. It’s never to soon to plot out my next adventure. Canada is still calling my name. chain sporting good store within 2 days of applying. I walked into the office with confidence and smiles. I walked out with the opportunity to be part of the retail sales force and I felt great. I love sports and have experience in a lot of different categories. Played or coached mainly but other stuff just a fan of. I’m really looking forward to being with like minded people. So how is me working going to lead to me have more road trip fun? I’ll have more money to spend on said trips. I keep eyeballing the kayaks and other water crafts we could use out on a lake trip. Plus the clothes, cool gear for camping, and upgrades for my bicycle. Oh my, so many options. I’m looking forward to this new adventure. Adding money into a retirement plan is a huge plus. Stay tuned for future spring and summer plans. Hoping Canada is in that summer destination trip. Welcome 2017, it’s snowing on this road trip, I was prepared! Instead of getting to travel calm and relaxed on this trip home from Reno, NV, we (meaning my son and husband) get to put the snow chains on and bump down the highway slow and steady. 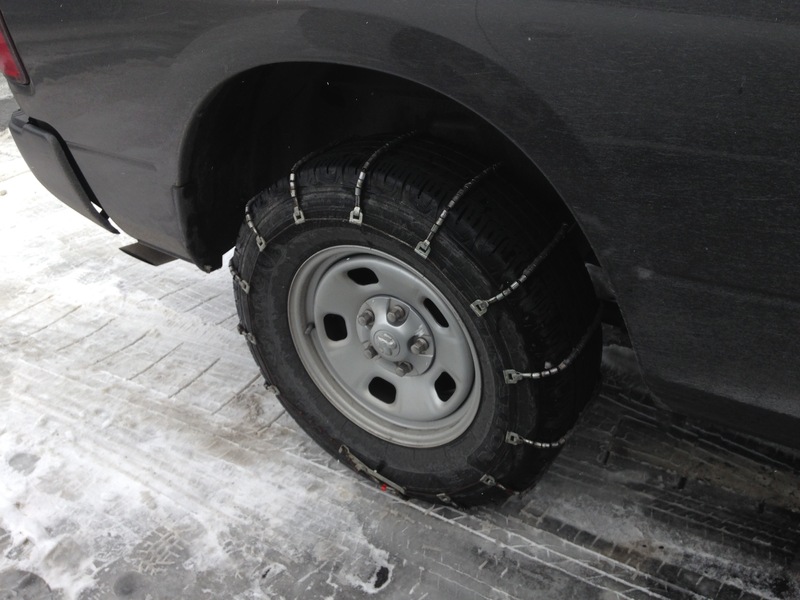 Our truck chains were perfect. Hubby could hab been on a timed pit crew he was so quick. Number 2 sons first experience putting chains on sucked. He brought the wrong ones. Good thing the gas station nearby carried some. I am proud of him for not getting upset and just getting through the frustrating situation and moving forward. So off we drive now, through the snow and ice. I always have towels, snacks, water and other things that may be needed on our trips. This has not been my favorite trip to say the least.